Four hundred years have passed since the first recorded African landing in English-occupied North America. It was in 1619 at Point Comfort, now part of Fort Monroe in Hampton, Virginia, that twenty-some Africans from Angola stepped off the transatlantic White Lion and set the stage for the slaves of the subsequent two-and-a-half centuries of American history. Joynes Road Church of God in Hampton has played an integral role to-date in the official commemoration of the pivotal events that unfolded so long ago. Though the special activities and events began during Black History Month this year, community and social involvement is nothing new for Joynes Road. Pastor Simeon Green provides a closer look. Simeon Green has served as senior pastor of Joynes Road Church of God since December 8, 2013. In the years since, he has been heavily involved in community activities, and he’s led his congregation to do the same. It’s not enough for them to simply be a fixture in their community; they’ve chosen to engage the community for the glory of God and the betterment of all. This involvement extends ecumenically to other churches, too, as Simeon Green lives out—and explicitly proclaims—“Jesus is the subject.” So, when the church had an opportunity to open its doors to host Faith-Based 1619 Community Roundtable on February 26, they were happy to take it. 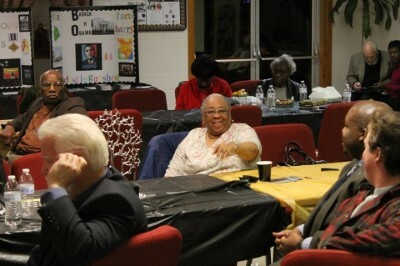 Cross-denominational gathering at Joynes Road in February. The dialogue was what brought them all together, and it centered on the events that transpired in their community in 1619. Indeed, such events transpired four hundred years ago, but the repercussions of those events linger to this day. Thus, the prompt before the roundtable was the role of Christianity in the black community. As you might imagine, the discussion was robust, insightful, and ultimately very helpful. But this meeting was just one of numerous programs, events, and exhibits slated to take place throughout the year to mark the four hundredth anniversary of that first-recorded African landing. 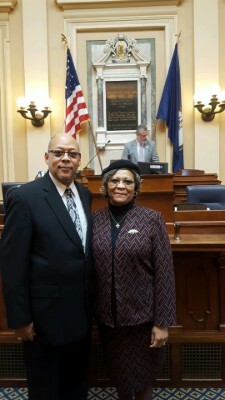 Simeon and wife Velma in 2018 at the Virginia General Assembly, where he opened in prayer. In this role, Pastor Simeon has attended numerous planning meeting in preparation for this special year in their community. He’s contributed time, talent, and treasure to help schedule and pull off a commemorative observance consisting of a community worship service, exhibits about the African American influence on Christianity, special presentations, and much more, all culminating in a “Commemoration Concert” and “Day of Healing and Gospel Music Festival” at the end of August. The location is replete with rich history and opportunities to discover the experiences of the past, thereby shining a light on opportunities we have in church and society for a better today and tomorrow. Visit www.hamptonva2019.com for more information on the 1619 landing and the commemorative activities slated to take place this year. There is much to learn, and we’re all certain to better for it. To learn more about the Church of God, visit www.JesusIsTheSubject.org. This entry was posted in All Church of God, Northeast and tagged 1619, 1619 Commemorative Commission, African, African American, Africans, American history, anniversary, black, black history, Black History Month, celebration, community, ecumenical, ethnicity, Fort Monroe, Hampton, Jesus Is the Subject, Joynes Rd Church of God, Joynes Road Church of God, multicultural, observance, Point Comfort, race, race relations, racism, Simeon Green, slavery, slaves, society, VA, Virginia. Bookmark the permalink.